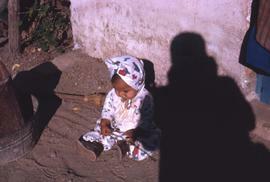 Colour Kodachrome 35mm slide depicts a baby sitting on a dirt floor. There is a shadow of a person on the right of the image. 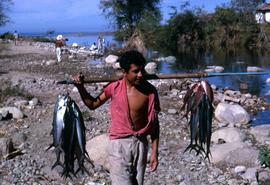 Colour Kodachrome 35mm slide depicts a boy standing on a beach carrying fish on either end of a wooden pole. Colour Kodachrome 35mm slide depicts Dr. Irving and Phyliss Snider posing for the camera while Phyliss drinks from a bottle. Colour Kodachrome 35mm slide depicts four men sitting in a boat with one man rowing and a ship in the background. Colour Kodachrome 35mm slide depicts a girl in a red dress and a boy in a white shirt posing in front of a white washed wall. Colour Kodachrome 35mm slide depicts a group of men with their backs to the camera pushing a boat into the water. One man on the left of the image is carrying a large full sack. Colour Kodachrome 35mm slide depicts Harry Nemetz and Phyliss Snider riding in a white convertible with an unknown man driving. Colour Kodachrome 35mm slide depicts Harry Nemetz sitting on a beach eating a piece of fish with a roasted fish on a stick next to him. Colour Kodachrome 35mm slide depicts Harry Nemetz sitting on a lounge chair, which has a brown towel draped over it, with a glass in his hand and a beer and plate on the table in front of him.